Online reviews, especially those solicited by Amazon and their ilk, tend to be pretty useless. Most people that are compelled to write a review of something seem to do it out of a particular love for that thing, or conversely, because of a particular axe to grind. You see few 3/5s on Amazon.com, and I recently trawled all the reviews available on Guitarcentre.com and found little that did not represent amazing value. For all of this, I could find little online in the past year to feed what I freely admit was becoming something of an obsession with the Hagström Viking semi-hollowbody electric guitar. I think I first read that these instruments were being reissued in late 2008, but you don’t see many in the wild, nor indeed, many reviews. So, why the obsession? Well, I tend to be a fan of semi-acoustic guitars in general, although very few ever seem to match original Gibson models. But just a quick glance at the Viking tells you how much character it has, and if Hagstöm cannot boast the heritage of Gibson, the Viking can at least call upon quite some pedigree of its own. Secondly, Hagström is a Swedish brand, originally producing all their guitars from Älvdalen in central Sweden until the early 1980s (a casualty, it seems, of the trashy Strat copy business that sprung up at that time). And lastly, today’s Vikings are really, really cheap. I determined that if I got one, I would provide as full a review as I could – what you now see before you. 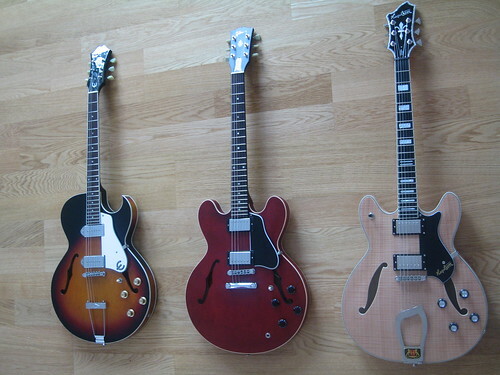 The Epiphone Sorento (on the left) cost €700 in 2002, and the Gibson ES-335 was $2,000 in 2007. The Hagström Viking is on the right. the Viking is very competitive. Looking at the other two models, the Epiphone is Korean made, and retains a very faithful 1950s shape to it. The Gibson is the “dot” model with only a “satin” finish, making it just one step up from a studio model, but it is made in US. The Viking, by contrast, is the deluxe model, which was around €100 more than the standard. The components are mostly manufactured in the US, the guitar is assembled in China (and it is of course, still designed in Sweden). There is one very important difference between these guitars: the Epiphone is a true hollow-body, while the Gibson and the Hagström are semi-hollow bodies (meaning that the neck is a single piece that continues through the length of the body, making two small sound compartments, rather than one large one). I tend to look at a lot of guitars, and love-at-first-sight with anything that is not a Gibson tends to be rare for me, but I will admit, it was the Viking’s looks that ensnared me. While the Gibson feels fairly timeless, the Hagström is more of a style piece, having something of a 70s feel -the Guild Starfire (no longer in production since Guild were bought out by Fender), has similar lines to the Viking. But it is not the body shape that really stands out on the Viking. It is the sheer quantity of design and accoutrement. 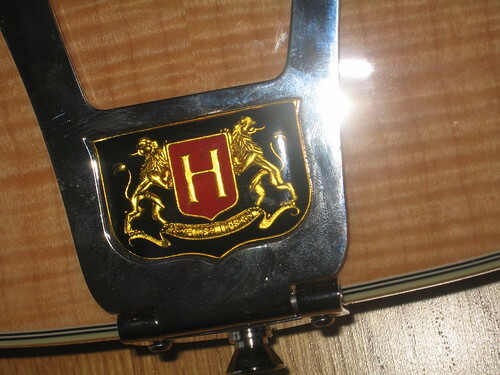 proudly showing the Hagstrom crest and boasting “Swedish Design”. The very distinctive bridge anchor is not in fact unique to Hagström – Rickenbacher have similar pieces – but it is an obvious indication that the Viking is its own guitar. Both the Gibson and the Epiphone have single-piece tops, but the Hagström has by far the better looking wood. I think the Epiphone’s sunburst is great, (and the Viking is available in a truly horrid amber sunburst) but neither the Epiphone’s wood grain nor finish are anywhere near the Hagström’s standard. 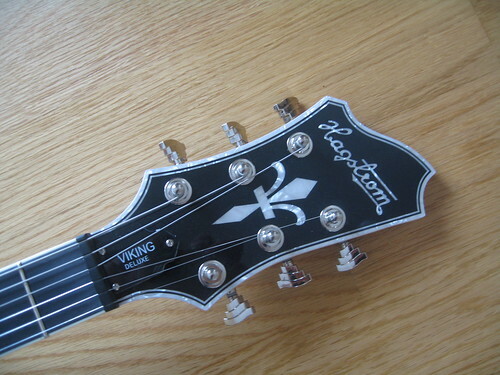 The Viking’s delightful narcissism is properly reflected in the headstock. The depth of detail and willingness to be different – the wave shape, the sculpted tuning-knobs and the fleur-de-lis all speak of self-confidence. The Viking is not imitating anything – it almost feels like it is daring other guitars to be so stylish. There does come a time when you do need to stop just looking at the Viking and play it. Hagström do the eminently sensible thing of having a technician set up the guitar before they ship it. So, the guitar that came out of the box was very, very playable. My only quibble would be a slight buzz on the lower E string which I might get around to adjusting. The guitar stays in tune very well and the tuning pegs have a nice feeling of even stiffness about them, and my only real concern at the moment is the lead plug which already appears to be coming loose. It can be tightened, but an electric guitar with poorly-installed electrics is very close to becoming an acoustic guitar. Most importantly, the Viking’s neck really surprised me. First, it is both shallow and narrow. I have quite big hands and like both the depth of a Gibson’s neck and the width of a Fender neck, so I was apprehensive, but as I note, the guitar is very easy to play (easier than, say, the Gibson which does ask more of you). The neck has no dead-spots and I only registered a very little buzz on one string. Up the neck, the fret spacing seems as perfect as my ear can tell. What is really interesting about the neck is (stop yawning) the structure and composition. There is some discussion of this on the Hagström site but nothing there actually tells you just how good the neck is: I have never played an instrument that offered so much real sustain (I say real sustain as opposed to the artificial, electronic variety or indeed, the overdriven feedback kind). The guitar really encourages left-hand vibrato and just seems to resonate with the body extremely well. The Hagström offers more sustain than the Gibson then, and has me working on my technique in anticipation of further rewards. If the Viking is sounding too good to be true, then read on. I was actually quite relieved to see the flaws in the build quality (and, surprisingly, component quality), because I wanted to know just where it was that my money was not going. So happily, it does not take much digging to see the corners which are cut in producing the Viking. The crest itself actually contains a flaw in the mold (between the upper stanchions of the letter H). A peek inside the f-holes s-holes shows that the wood has been fairly roughly gouged to fit the wiring in, and there is quite a mess of glue inside. 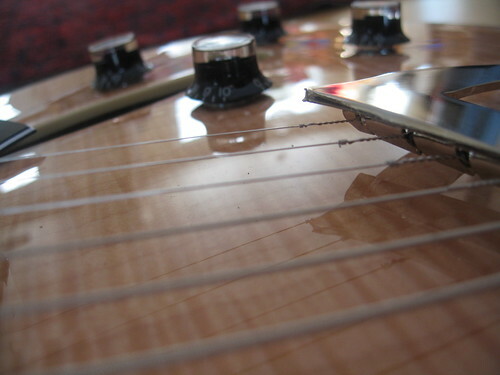 If these things seem trivial, they are, but it is worth noting that these kinds of details are perfect on a Gibson. And there is one thing that no blog can convey. Even at 3 years old, the Gibson still has a soft, sweet smell of maple wood. The Hagström, by contrast, smells entirely of glue. So, let’s say it: the Hagström sounds great. It has a bright twang, a reasonably soft neck pickup and plenty of bite on the bridge. I play exclusively with a clean sound, so I have not gone looking for much crunch, but even at the slightest hint of overdrive, the Viking performs well. It might not have the Gibson’s manageable power (and by the way, I have played a few unmanageable Gibsons too) but it has plenty of body. It sounds authentically like a semi-acoustic, much more so than the relatively weedy Epiphone Sorento. and the Gibson’s tone is markedly more distinguished: more warmth and sweetness which lend more sympathy and authority to the playing. The remarkable thing about the Viking is that I find myself comparing it not to a guitar in a similar price bracket (the Epiphone Sorento), but to an instrument that would cost up to five times as much, the Gibson ES-335, and it certainly looks like an instrument in that range, at least at first blush. I cannot score the Viking better than the ES-335 because, in the end, it is all about the sound. And what’s more, the ES-335 is an icon to me, and to many other guitarists. For all that, anyone considering a semi-acoustic should consider a Hagström Viking. It really is a lot – a lot – of guitar for your money (for the price of the Gibson you could buy a Viking and a high-end solid body and still have change) and still seemingly a relatively well kept secret. Hagström are to be commended for this instrument. I’ve had mine for 3 years now. First thing I did was switch out electronics and upgraded the pickups to single coils with low 7.4k ohms from Klein. My guitar now rivals many guitars twice it’s price, at least. If I lost this one or broke it, I’d buy a new one right away. Viking Deluxe is such an underrated guitar. I get compliments on my tone all the time. The volume backed down on the guitar going through a boss blues driver or fuzz face… Instant 60’s vibe. I installed a Bigsby on mine too. Get compliments on looks too. Mine is in white and black. glad to see the blues have made it to sweden. the viking seems like a good guitar for a newcomer who wants to learn, but can’t quite justify a pricey ES-335. i enjoyed the photography on this post. 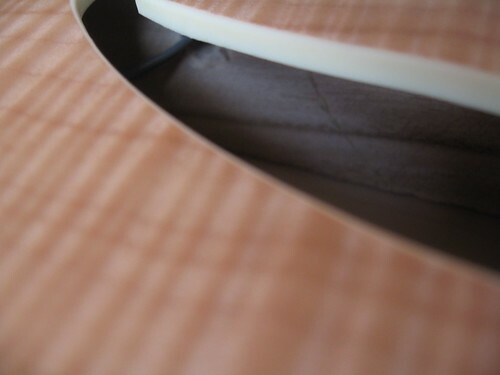 the detail that you pointed out on the camera shots pointed out precision of the make compared to other guitars. but, i have to say, that ES-335 does sound so soulful. as if it sold it’s soul just to sound better. keep on rockin’ in the democratically socialistic free world. I would say the Viking is way better than a newcomer’s instrument. A newcomer should learn on an acoustic anyway… the Viking comes really close to the ES-335. I would take the Gibson first, but the Viking is a great option. Being left handed, i don’t have a great range of guitars to choose from, and an even less chance of trying before buying. Been looking at the lefty range at rondomusic.com but keep coming back to the viking, it’s a beautiful looking guitar. Been thinking of putting tv jones pickups in. I really like GIBSON ana also Epiphone price. Lespaul’s cool always. Wow, this was a very good indepth review. Thanks for posting this! I was on the fence with this guitar but I think I’m going to go for it. I currently don’t have the means to buy a ES335 so this sounds perfect for me! Do you think you could answer a couple questions about the neck for me though. The Hag is incredible, and it does do things a Gibson can’t do… but of course, of course, you can hear why a Gibson costs so much more. It would be a crazy world if you couldn’t. Saying that, after having a Hagstrom Viking nearly a year, I am still surprised by it every time I pick it up. Glad you’re enjoying yours too. Thx for the reply. It’s interesting that I didn’t experience the same manufacturing flaws as you did, except for a strange issue with the Tune-o-matic. Being a semi-hollow aficionado maybe you can help 😉 I have no fret buzz, however the B string occasionally has a (loud) buzz that seems to come from the bridge – I can’t find any loose screws, etc. It seems silly that will all the quality pieces in the Viking, that Hagstrom would skimp on the bridge. I’m guessing this is a rare issue. Any ideas for a fix? Great review. I have scoured the Web for reviews on the Hagstrom Viking but wasn’t satisfied by them because it sounded very bias in the sense that the reviewers only extol the virtues of the guitar but never mentioned the inherent flaws. I guess that’s the difference between being just a spokesperson for the product and being the actual owner of it. If I had a lot of money, I would not hesitate to buy an Gibson ES-335 but after discovering and researching the Hagstrom Viking, I felt that this will be a very good alternative to the ES-335. Thanks for a balanced review. It has made me more excited about the prospect of owning a Hagstrom Viking in the next few days. Great review!! Totally excellent and I thank you for taking the time to post. I like the tone. It is not the tone of the 335, but better than the other clones. The neck is a bit thinner than I prefer (I also play Nocasters and ’56/’57 Goldtops) but no issues with playbility. I played it at an open Blues jam last night and got great comps on the tone. A few other guys played and were impressed. I haven’t finished my full beat down of just yet. I need to play in on some paying gigs thru a few different amps and then determine if it stays in the house as “Jessica Rabbit #50” . The quality is definitely comparable to my Edwards and Epi which were 3x+ the cost of the Viking. Mine is candy apple red and very, very glossy. I was impressed with my Edwards – preaged binding, nice tone from the SDs and stays in tune. With the Edwards, I had two frets that needed some adjustments. On the Viking, nothing so far needs to be done to it. I think once it cures in the Florida weather I may need a neck adjustment. I play 11s and 12s in standard tuning which tend to put a great deal more tenison on things. I hope the Viking can hang in there like all the others have done over the years. The Viking is one of the best kept secrets out there. For the money, it is an excellent guitar. I’ve been checking on eBay to compare prices and I really lucked out on what I paid for mine. I didn’t know it at the time and I am glad I took the quick plunge and got it. However, it can’t be said enough that we are talking about a guitar less than half the price of a 335. And for that price, it is a joy to play and an incredible, serious sonic tool. I had been looking for a dependable, humbucking semihollowbody with a trem bar; the Viking exceeded my expectations. So many other guitars in that price range have, if not a “toy” look, then a toy sound. Prospective buyers should take to heart the frequent comparisons to the Gibson 335; not quite as sweet and subtle as the 335, but harmonically rich and versatile in its own right. I think any musician would be happy to own this instrument. Thank you for this review. I too decided to plop down my money on a Hagstrom Viking. I have a Heritage 535 with Seth Lover pickups, a Prestige Delux LP with Seymore Duncan pickups and all American electronics, a Gibson Melody Maker and Guild D40 acoustic. I wanted another 335 type and thought the Hagstom had a great (different) sound I was lookiong for at a fraction of the price of a 335 Gibson or even Epiphone. I also love the Hagstom fret board. Your right, the neck is easy to play and fast – incredibly fast! I think it plays better than my 535 which is butter smooth. The dealer gave me a discount I couldn’t refuse and even threw in a Hagstom HS case as an extra incentive when I hesitated. All in all, I couldn’t be happier evne with some of the Oriental build flaws which, btw, you have to really look for . I’d add one thing to your review. The headstock, tuner knobs and “S” hole shapes were all designed by James D’Aquisto, when Hagstrom contracted him to design the original Hagstrom Jimmy in the late 1960s. Hagstrom then took these designs and applied them to their 70s era Vikings, Swedes and Super-Swedes. Now they have also been used on the Chinese guitars. I want to start with a thank you for your commendable review. I got to play both VIking Deluxe and Deluxe Tremar at a guitar shop in London. I went for the Tremar, seems more versatile if you know what I mean, also the “cool” factor. What intrigued me was the fret buzz. Viking Deluxe had considerably less compared with Tremar, in fact none at all. On my Tremar – D string from 1st to 5th, A string was horrendous from nut to twelfth, and the E string from 1st to 3rd. It had been set-up right there and then by a professional (I suspect he simply raised the bridge; it wasn’t done in front of me). It was stilI quite buzzy, but less so. I was promptly told that I should “play it in a bit” and if the problem persists, to bring it back for a further look or potentially a replacement. So my question would be how terrible was your fret buzz and would you recommend taking it back after say a few weeks of playing it? I heard in some review on youtube that you do get a doozy every now and again. Think I might have got one of the 3/20 that the guy was talking about. The fret buzz was pretty minimal – I had to go looking for it – around the 12th fret on the heavy E string. As far as I know, it hasn’t cleared up, but I really am not fretting that note there very often. The action on the guitar is so good, however, I am loathed to do anything with the setup. I can’t believe that a Viking Deluxe should have a significantly better setup than a Tremar: I’d take it back and ask for help. Good luck! That cleared up a few things. I’ve been playing it for a week now and it still seems quite buzzy and on same frets. Think I’ll be calling the shop some time next week. I will let you know how that goes. When I researched Hagstrom initially everyone recommended it for playability and sustain. Find it hard to believe that I was the unlucky to get the runt. It’s really great to hear about the new Vikings from some knowledgeable people. I have a 1967 Viking that I got in Vietnam from a guy who had just come from Sweden and needed the money. I played it for awhile there and then didn’t anymore for about 35 years. Normally played my 57 Gibson. Got back into it in the last 3-4 years and it is absolutely amazing. It holds the tuning for weeks on end and the sustain is incredible. I am going to try the new one’s next year if possible, and see how they compare. Hi I enjoyed your review. I bought a Viking Deluxe recently and I must say I think you were a little unlucky with some of your quality issues, the neck join on mine is flawless in fact it doesn’t have any of the build flaws you highlighted, maybe I was lucky. i do have a little buzz on the bottom E but it’s manageable. Overall I find it a joy to play; sadly I’ve never played a ES-335, i usually play strats and tele’s so for me the tone and sustain on this is really exciting. Thank you all for the thorough review on the HAGSTROM Viking. I am considering to add this to my guitar collection. I recently bought a “Michael Kelly Patriot Special” with a saddle and end piece in one unit. 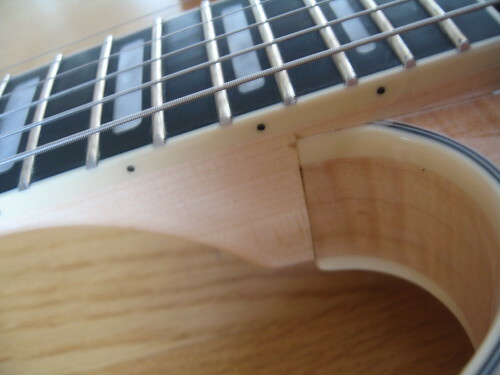 I lowered the saddle so that the action at the 12 fret is 2/32″ which suits my playing style very well, but I get a fret buzz when I play the ” Blues Shuffle” on the low E.
How low the action can be with the Viking Hag? 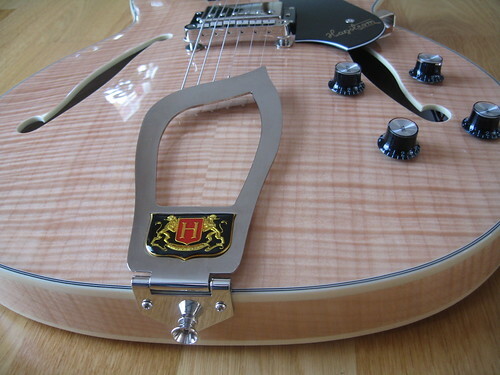 The Hagstrom website claims that you can get a very low action because of the H-expander truss rod. To my knowledge lowering the action happens when you lower the saddle assuming that the fretboard is near straight. 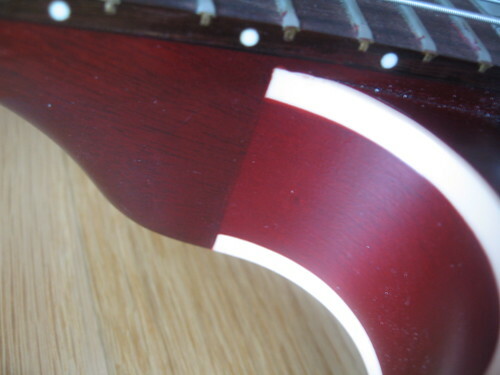 If buzz happen then it is a fault of a one of the fret wires being a bit higher. Correct me if I am wrong please. Also how heavy is your HAGSTROM Viking in lb (approximately)? Has anyone tried installing SD ’59 humbuckers or similar in the Viking Deluxe? I’d love to hear what the tone would be like. Yes – ’59’s are wonderful, especially the middle position. I had my heart set on coil-taps, so I ended up swapping a pair of ’59’s for a JB/Jazz pair and push-pull pots. Certainly hotter, but the versatility is pretty amazing. oh – as to the sound of ’59’s. Clarity and sweetness. The stock Hag’s are nice, but fairly one-dimensional (and a little too hot IMO.) The ’59’s get you much closer to a round, slightly compressed 335 sound. I just purchased a new Viking Deluxe and I was wondering if it was normal for the trapeze to be touching the body of the guitar? It is only touching where the low E, A, D are held. If anyone has any insight please respond. Got my lefty Viking two days ago…trapeze is NOT touching the body, but close on high E end. Very impressed with this guitar (I have a LP Stnd Trad Plus, SG Stnd, USA Strat) and it plays as well as any I own. My son who lives at home also has a similar set of guitars and he’s equally impressed. What the graphite/tusq nut giveth, the tuners taketh away (my only complaint). Neck is very very slim. Pots seem ok (I don’t mess with them much). Pickups are very nice sounding, a little on the bright side, but with plenty of HB’ing punch when amp is driven. Fit/finish are excellent. Thanks for the review. I totally agree that there are too many useless reviews out there (Amazon etc). I own two Hagstrøms (Super Swede Tremar -> fantastic + HL550 – also great), and some more expensive guitars (Taylor/Ibanez) but I like the Hagstrøms just as much as the more expensive ones. Even for being cheap China guitars, I really love them – and I want more. The Viking is one of them. Thanks for a great review. I used to have one of the original Swedish ones in the late 70s (loved it) and it was stolen so I took the plunge and bought a “B” Stock Viking (tiny brown dot in the cream binding) on eBay about 15 months ago. Cost under US$500 delivered to Australia. I have 25 guitars, mostly US Strats & Teles with various pick-up configs, a smattering of Japanese Fenders, a Les Paul (that nobody can get to stay in tune and Gibson don’t care about), a 335 and a genuine 1959 Maton (Hi-end Australian Brand) Jazz Box. My Guitar Tech had never seen a Viking (he now owns one and his boss has two). The Viking is a dream to play and sounds pretty good as well. I’ve been playing “in yer face” rock and blues for 43 years and it hit me about a month ago that I haven’t touched the 335 for 6 months. I’ve found that I’ve transitioned to using only the Viking and a couple of Fenders for Blues. I would never say that the Viking is “better” than the 335, but it feels more solid, has a more versatile neck and is just “different” from the 335. Using Class A amps and no effects, I find that I can get the right sound out of the Viking to play Santana, Clapton, Stevie Ray Vaughan and at a pinch, George Benson. I’ve grown so accustomed to the Viking sound and feel that when I plugged in my 335, it just didn’t sound or feel right any more. Weird. 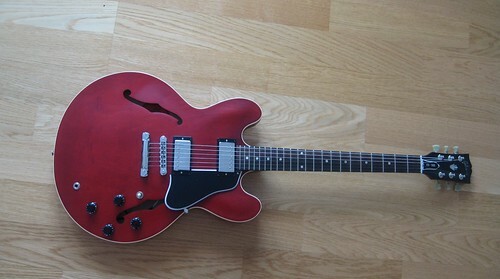 The end result is that the 335 is now on the market and I’ve ordered a Viking Deluxe 12-string. Made in China or not – I’m a fan. purchase a Hagstrom Viking Tremar Deluxe in Dec 2012, and the sound is amazing, buzz on the frets. my question is changing the strings was kind of painfull. is there some kind of a trikc to change those that would take less time???? @Michel. I assume you’re having trouble stringing at the tailpiece since the tuners are actually pretty solid. I find strings slip out of the (awful) trapeze tail while you’re stringing, so I resorted to putting a thin piece of black foam under it. 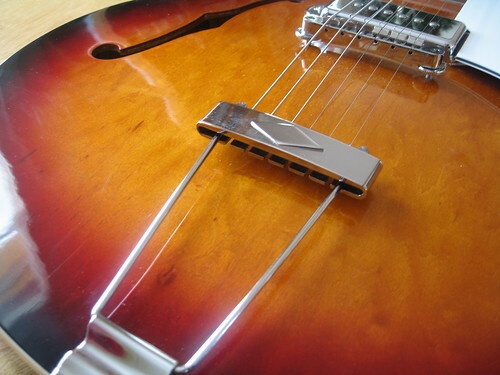 This does two things: first, it stops the tailpiece vibrating on its own and adding unwanted ringing. Second, it helps hold the strings in place when you change them. After having my for two years and modding the pickups, TOM and electronics, I’m still tempted to swap the trapeze for a proper Gibson-style stop tailpiece. I noticed the new Hagstrom line has a baritone model with a stop-tail! Hopefully more future Hags will have them. sorry I forgot to saw that I have no buss on the frets, and yes I do love the gibson ES-335 but very happy with my new Hagstrom, fantastic price for the quality guitar. I have a 2007 Hagstrom Viking Deluxe flame maple top, which did not have any of the flaws mentioned in this article but one. Neck to body joint is flawless. I checked inside the f holes and found no glue buildup at all. I did have to tighten the lead in once like article claimed and the three way switch plastic cap broke off, my fault easy fix. I bought mine used at a reputable guitar shop thus getting to see it and play it before purchase, it was flawless. 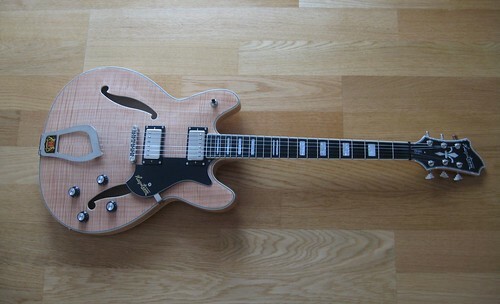 I liked the feel and playability better than the Epi Dot 335, the Ibanez which was sweet, EPI Sorrento to high priced. The Hagstrom Viking Deluxe neck is to die for I play thru a Blues Junior 111 miked into a PA system. Sometimes I plug into a Pignose 60R Studio Reverb also miked to the PA. or Kustom Quad 100 DFX. Jazz, Blues, Country, the clarity and tone are superb. If you like distortion with high gain go for it. One sweet axe. The guys in our group love it. Totally enjoyed your review, especially from the nordic context. Anyways, how about the thickness of the “alloy” trussrod? Only 3mm thick, I believe? Yikes! Isn’t the industry standard more like 4-5mm? Doesn’t it scare ya? Best to grease well, to avoid future possible stripping, I guess. Heard from a dealer, when checking one beauty out, that newer ones were thicker, -4MM? Either that he said, or possibly he was thinking of the new baris and/or basses re: 4mm thickness of ‘rod. Any knowledge/experience to share on this stuff? Thanks for your attention. Greetings from Canada. Thanks for a great and comprehensive review…makes a change from the majority of them one sees around! I have the opportunity to buy a used basic Viking model but I already have an ARIA PRO II model TA-40, made in Korea probably late 80s/early 90s which plays very decently in my opinion. Do you have any experience with these? Since I am no professional or expert, I wouldn’t know how much better one guitar is from the other. My question is would you know if the Viking is a better guitar than the Aria Pro? If so, I would buy it and sell the Aria but what can I do to compare them? Nice review. I recently played a friend’s 1972 Hagstrom Viking. Unplugged, the thing sounds like a full hollow – I’ve never heard a semi-hollow sound so alive. The neck’s playability was also awesome. I’m not sure that the difference in the two sounds in the video isn’t attributable to the pickups. Has anyone played both a vintage and a present day Viking? Care to comment on any differences noticed? Years ago I had a 335 that I dearly loved. I foolishly sold the guitar and for the next 15 years I regretted it big time! Two years ago I purchased a new hagstrum Viking deluxe. I absolutely love this guitar! Although I haven’t made a side by side comparison the viking plays and sounds every bit as good as my old gibson. The finish is beautiful, the neck is fast, it’s very very easy to play, and I get tons of complements on it wherever I go! I don’t think there’s a better deal on the market and I would definitely recommend hagstrum to anyone. Being on the verge of buying a Hagstrom Viking Deluxe I found this review extremely useful. I might pay a visit to my favourite Antwerp guitar shop one of these days to get me one – as a matter of fact, the only one selling Hagström guitars. But first I will have to found if the electric sustain will do… Every once in a while I need some noise. nice review, have 1967-ish Hagstrom Viking in Tobacco Sunburst, my first guitar from when I was pre-teen; check out The Association opening act at 1967 Monterey Pop Festival, “Along Comes Mary”, also same song on Smothers Brothers Show. Good review of a great guitar. I have had quite few Hagstroms and own a Viking (Rextone). The let down for me is the tailpiece. It is stylish but it is a bit of a let down regarding the quality. Its a piece of pressed tin, with another slotted piece of bent tin spot welded to it on the underside to take the strings. Its not very well finished on the underside, some would say rough, the bridge is reasonable, certainly not the worst out there and is otherwise a great guitar in every respect. The neck is fantastic as you would expect, it responds well to relief adjustment and is very stable. I changed to a standard tuneomatic bridge and Tailpiece setup using some nice Gotoh hardware. The guitar, for me, is now awesome. Great review! Funny, I read it months after I got my Viking deluxe. Couldn’t give a better review if I tried except for the flaws. Mine is great. Only issue was the lead was completely unscrewed and had a terrible time trying to re-secure it. Other than that, haven’t put it down. Sorry Gibson, it’s better looking, better playing and better sounding than the ES137 I have. Hello Patrick! I’m a newcomer to the semi hollow guitars and I’m thankful for your thorough review. I’ve always liked 12 string acoustics, and am starting to play and compose for church. Question: there is a Hagstrom Viking DLX 12 string I have my eye on. I’m a little concerned about the buzz. As you can imagine, 12 string guitars are a little difficult to manage. $700 is the price. Is it something I should add to my collection? You should have sent it back, mine came out of the box yesterday FLAWLESS. I think there’s an explanation in a video on the website regarding that as well. Some get sent with flaws, rarely, but the company you but it fun should have taken it back. Nice detailed review. And I’m finding that I agree with just about everything you say as in use mine more and more. Great axe and dollar for dollar an absolute bargain! !